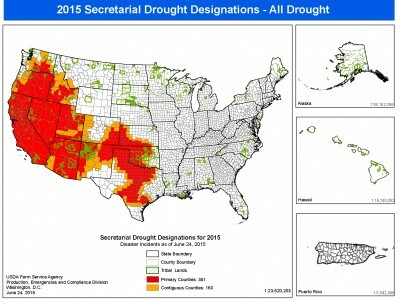 *The following information is an archive of 2015 Drought Relief Updates. Drought relief information will be updated in the event of another drought. The Washington State Department of Agriculture will assess 2015 drought losses, an unprecedented attempt to pinpoint which regions and crops are most vulnerable in water-short years. The Federal Emergency Management Agency has denied assistance to residents in three Eastern Washington counties who suffered uninsured losses in wildfires this year. The Washington Department of Ecology has awarded drought-relief grants to irrigation districts in Kennewick and Wenatchee. The director of the Farm Services Agency urges producers to document their losses and review programs that may help them recover. As of September 2, 2015, all 39 counties in Washington State are designated primary disaster areas and qualify for aid. As of the date on the map linked 34 counties in Washington are primary disaster areas; 4 counties are contiguous disaster areas. San Juan remains the only county in the state which has not yet been declared a designated natural disaster area. “Many of our county offices have already taken applications for losses related to drought but now we are hearing about damage due to wildfires,” said Olson, whose agency administers federal farm programs. The Livestock Forage Disaster Program reimburses livestock farms with drought losses on pasture. 38 Counties in Washington now qualify for financial aid through USDA. 33 of those counties are primary, 5 are contiguous; San Juan remains the only county in the state which has not yet been declared a designated natural disaster area. The primary counties are Adams, Columbia, Grant, Walla Walla, Benton, Franklin, Klickitat and Yakima. Contiguous counties which also qualify for aid are Douglas, King, Lewis, Okanogan, Skamania, Garfield, Kittitas, Lincoln, Pierce, and Whitman. Presentation by Jennifer Holderman, Washington State Department of Ecology.